The present invention relates to ionic silicone hydrogel polymers displaying improved thermal stability. More specifically, the present invention relates to a polymer formed from reactive components comprising at least one silicone component and at least one ionic component comprising at least one anionic group. The polymers of the present invention display good thermal stability and desirable protein uptake. This application claims priority to Provisional Patent Application U.S. Ser. No. 61/101,455 which was filed on Sep. 30, 2008, the contents of which are relied upon and incorporated by reference. The present invention relates to ionic silicone hydrogels, and ophthalmic devices formed therefrom, which display desirable protein uptake profiles and improved hydrolytic stability. Contact lenses made from silicone hydrogels have been disclosed. These silicone hydrogel lenses have oxygen permeabilities greater than about 60, and many provide reduced levels of hypoxia compared to conventional hydrogel contact lenses. However, silicone hydrogel lenses have different rates for adverse events than conventional hydrogels, and it would be desirable to maintain the oxygen transmissibility of a silicone hydrogel, but achieve the low adverse event rate of the best conventional hydrogel lenses. Unfortunately, attempts to add anionic components to silicone hydrogels in the past have produced contact lenses which are not hydrolytically stable and display moduli which increase when exposed to water and heat. For example, the modulus of Purevision lenses (Bausch & Lomb) increase from 155 psi to 576 psi when heated at 95° C. for one week. It is believed that the cause of this increase in modulus is the hydrolysis of terminal siloxane groups followed by condensation reactions to form new siloxane bonds and introduce new crosslinks. Even though Purevision lenses contain about 1 weight % ionicity, they uptake relatively low lysozyme levels (less than about 50 μg), and a majority of the protein uptaken is denatured. It has been suggested that the instability of ionic silicone hydrogels could be reduced by using silicones components having bulky alkyl or aryl groups instead of silicone monomers such as 3-methacryloxypropyltris(trimethylsiloxy)silane (“TRIS”) or 2-methyl-,2-hydroxy-3-[3-[1,3,3,3-tetramethyl-1-[(trimethylsilyl)oxy]disiloxanyl]propoxy]propyl ester (“SiGMA”). However, the bulky siloxane monomers are not commercially available and may be expensive to make. The present invention relates to ionic silicone hydrogel polymers displaying improved thermal stability and desirable protein uptake. More specifically, the present invention relates to silicone hydrogel polymers and contact lenses formed from reactive components comprising at least one silicone component and at least one anionic component in an amount between about 0.1 and 0.8 wt %. The present invention relates to ionic silicone hydrogel polymers displaying improved thermal stability and desirable protein uptake. More specifically, the present invention relates to silicone hydrogel polymer and contact lenses formed from reactive components comprising at least one silicone component and at least one anionic component comprising at least one carboxylic acid group in an amount between about 0.1 and about 10 mmol/gm. FIG. 1 is a graph showing the change in modulus at 55° C. of the lenses of Examples 1-4 and Comparative Example 1 as a function of time. FIGS. 2-4 are graphs showing, for the lenses of Examples 6-7, the change in modulus, toughness and elongation at 55° C. as a function of time. FIG. 5 is graph showing the concentrations of PQ-1 and lysozyme uptaken in the polymer formed in Examples 10-18 and Comparative Example 2. It has been surprisingly found that ionic silicone hydrogel polymers and articles made therefrom may be made having acceptable thermal stability and desirable protein uptake characteristics. As used herein, a “biomedical device” is any article that is designed to be used while either in or on mammalian tissues or fluid. Examples of these devices include but are not limited to catheters, implants, stents, and ophthalmic devices such as intraocular lenses and contact lenses. The medical devices, ophthalmic devices and lenses of the present invention are made from silicone elastomers or hydrogels, which include but are not limited to silicone hydrogels, and silicone-fluorohydrogels. These hydrogels contain hydrophobic and hydrophilic monomers that are covalently bound to one another in the cured lens. As used herein “uptake” means associated in, with or on the lens, deposited in or on the lens. As used herein “reactive mixture” refers to the mixture of components (both reactive and non-reactive) which are mixed together and subjected to polymerization conditions to form the ionic silicone hydrogels of the present invention. The reactive mixture comprises reactive components such as monomers, macromers, prepolymers; cross-linkers, initiators, diluents and additives such as wetting agents, release agents, dyes, light absorbing compounds such as UV absorbers and photochromic compounds, any of which may be reactive or non-reactive but are capable of being retained within the resulting medical device, as well as pharmaceutical and neutriceutical compounds. It will be appreciated that a wide range of additives may be added based upon the medical device which is made, and its intended use. Concentrations of components of the reactive mixture are given in weight % of all components in the reaction mixture, excluding diluent. When diluents are used their concentrations are given as weight % based upon the amount of all components in the reaction mixture and the diluent. Anionic components are components comprising at least one anionic group and at least one reactive group. Anionic groups are groups which bear a negative charge. Examples of anionic groups include carboxylate groups, phosphates, sulfates, sulfonates, phosphonates, borates, mixtures thereof and the like. In one embodiment the anionic groups comprise three to ten carbon atoms, and in another, three to eight carbon atoms. In an embodiment the anionic groups comprise carboxylic acid groups. Reactive groups include groups that can undergo free radical and/or cationic polymerization under polymerization conditions. Non-limiting examples of free radical reactive groups include (meth)acrylates, styryls, vinyls, vinyl ethers, C1-6alkyl(meth)acrylates, (meth)acrylamides, C1-6alkyl(meth)acrylamides, N-vinyllactams, N-vinylamides, C2-12alkenyls, C2-12alkenylphenyls, C2-12alkenylnaphthyls, C2-6alkenylphenylC1-6alkyls, O-vinylcarbamates and O-vinylcarbonates. Non-limiting examples of cationic reactive groups include vinyl ethers or epoxide groups and mixtures thereof. In one embodiment the reactive groups comprises (meth)acrylate, acryloxy, (meth)acrylamide, and mixtures thereof. Examples of suitable anionic components include reactive carboxylic acids, including alkylacryl acids, such as (meth)acrylic acid, acrylic acid, itaconic acid, crotonic acid, cinnamic acid, vinylbenzoic acid, fumaric acid, maleic acid, monoesters of furmaric acid, maelic acid and itaconic acid; N-vinyloxycarbonyl alanine (VINAL), reactive sulfonate salts, including sodium-2-(acrylamido)-2-methylpropane sulphonate, 3-sulphopropyl(meth)acrylate potassium salt, 3-sulphopropyl(meth)acrylate sodium salt, b is 3-sulphopropyl itaconate di sodium, b is 3-sulphopropyl itaconate di potassium, vinyl sulphonate sodium salt, vinyl sulphonate salt, styrene sulfonate, sulfoethyl methacrylate and mixtures thereof and the like. In one embodiment the anionic component is selected from reactive carboxylic acids, in another from methacrylic acid and N-vinyloxycarbonyl alanine. In one embodiment the ionic component comprises methacrylic acid. In one embodiment, the anionic components is included in the reactive mixture in amounts between about 0.05 and about 0.8 weight % and in some embodiments between about 0.1 and about 0.8 weight %. In another embodiment, the anionic component comprises at least one carboxylic acid group and is present in the reactive mixture in amounts between about 0.1 mmol/100 g and about 10 mmol/g. By maintaining the concentration of anioinic component within the ranges recited herein, the stability of the polymer may be improved. Surprisingly, it has been found that polymers having the amounts of anionic component recited herein have desirable protein uptake profiles in addition to improved stability. In another embodiment, the amount of anionic component may vary based upon the structure and concentration of the silicone components as well as the structure of the anionic component so long as the molar product of the anionic groups and the Si from TMS groups is below the mole product described below. The silicone hydrogel polymers of the present invention display stable modulus. As used herein, stable modulus are those which increase less than about 30%, and in some embodiments less than about 20% over eight weeks, at 55° C. In some embodiments the silicone hydrogel polymers of the present invention display modulus that increase by less than about 20% over 20 weeks at 55° C.
Silicone components are reactive and non-reactive components which comprise at least one “—Si—O—Si—” group. It is preferred that silicone and its attached oxygen account for about 10 weight percent of said silicone component, more preferably more than about 20 weight percent. Prior attempts to add anionic components to silicone hydrogels have generally resulted in polymers which display modulii which increase over time or when exposed to heat. It is believed that the cause of the increasing modulus is the hydrolysis of terminal siloxane groups followed by condensation reactions to form new siloxane bonds and introduce new crosslinks. Hydrolytic stability of silicone groups (specifically the silicon-oxygen bond) is believed to be influenced by the substituents on the Si atom. Bulkier groups provide greater hydrolytic stability through increased steric hindrance. The substituents can be alkyl groups (methyl, ethyl, propyl, butyl etc. ), aryl (e.g. benzyl) or even other silicon-containing groups. On the basis of steric hindrance, silicone materials containing trimethylsilyl (—OSiMe3) groups (such as SiMAA or TRIS) are generally less hydrolytically stable in the presence of ionic components than compounds containing polydimethylsiloxane[(—OSiMe2)n] chains, such as mPDMS. Thus, in this embodiment, the stability of the polymer is further improved by selection of the silicone containing components in combination with controlling the concentration of the anionic component. In one embodiment, the silicone component comprises at least one polydimethylsiloxane chain, and in another embodiment, all silicone components are free of TMS groups. 1) In calculating the mole fractions according to the present invention, the reactive components of the monomer mix (i.e. excluding diluent(s) and processing aids which are not permanently incorporated into the lens) are represented as weight fractions summing up to a total of 100 g.
2) The moles anionic group=(grams of anionic component/MW of anionic component)*number of anionic groups in the anionic component. For Example 1, containing 1% methacylic acid, the calculation is (1 gm/86 gm/mol)*1=0.012 moles carboxylate. 3) The moles TMS=(grams silicone component/MW of silicone component)*number of TMS groups per silicone component. For example, in Example 1, containing 30 gm SiMAA the calculation is (30 gm/422.7 gm/mol)*2=0.142 moles TMS. In formulations containing a plurality of silicone components having TMS groups, the moles TMS are calculated for each silicone component and then summed. 4) The stability product is calculated by multiplying the values for the moles carboxylate and mole TMS. Thus the stability product for Example 1 is 0.012*0.142=0.0017. wherein b is 2 to 20, 3 to 15 or in some embodiments 3 to 10; at least one terminal R1 comprises a monovalent reactive group, the other terminal R1 comprises a monovalent reactive group or a monovalent alkyl group having 1 to 16 carbon atoms, and the remaining R1 are selected from monovalent alkyl groups having 1 to 16 carbon atoms, and in another embodiment from monovalent alkyl groups having 1 to 6 carbon atoms. In yet another embodiment, b is 3 to 15, one terminal R1 comprises a monovalent reactive group, for example, a (meth)acryloxy C1-6 alkyl, which may be further substituted with at least one hydrophilic group, such as hydroxyl, ether or a combination thereof, the other terminal R1 comprises a monovalent alkyl group having 1 to 6 carbon atoms and the remaining R1 comprise monovalent alkyl group having 1 to 3 carbon atoms. In one embodiment one terminal R1 is (meth)acryloxy C1-6 alkyl, which is optionally substituted with ether or hydroxyl, the other terminal R1 is a C1-4 alkyl, and the remaining R1 are methyl or ethyl. Non-limiting examples of PDMS components of this embodiment include (mono-(2-hydroxy-3-methacryloxypropyl)-propyl ether terminated polydimethylsiloxane (400-1000 MW)) (“HO-mPDMS”), and monomethacryloxypropyl terminated mono-n-C1-4 alkyl terminated polydimethylsiloxanes, including monomethacryloxypropyl terminated mono-n-butyl terminated polydimethylsiloxanes (800-1000 MW), (“mPDMS”) and monomethacryloxypropyl terminated methyl terminated polydimethylsiloxanes (800-1000 MW), (“mPDMS”). In one embodiment all silicone in the reactive mixture are PDMS components. R denotes, hydrogen or methyl; q is 1, 2, 3 or 4; and b is 1-50. In these embodiments care must be taken to make sure the vinyl carbonate or carbamate silicone component does not also comprising TMS groups, or the mole product ratios specified herein will be difficult to achieve. wherein R1 is as defined for a terminal group above. In some embodiments, small amounts of vinyl carbamate and vinyl carbonate compounds comprising TMS groups may be used. Such groups include 3-(vinyloxycarbonylthio)propyl-[tris(trimethylsiloxy)silane]; 3-[tris(trimethylsiloxy)silyl]propyl allyl carbamate; 3-[tris(trimethylsiloxy)silyl]propyl vinyl carbamate; trimethylsilylethyl vinyl carbonate; trimethylsilylmethyl vinyl carbonate, combinations thereof and the like. wherein at least one R1 comprises a monovalent reactive group, and in some embodiments between one and 3 R1 comprise monovalent reactive groups. In one embodiment b is zero, one R1 is a monovalent reactive group, and at least 3 R1 are selected from monovalent alkyl groups having one to 16 carbon atoms, and in another embodiment from monovalent alkyl groups having one to 6 carbon atoms. Non-limiting examples of silicone components of this embodiment include 2-methyl-,2-hydroxy-3-[3-[1,3,3,3-tetramethyl-1-[(trimethylsilyl)oxy]disiloxanyl]propoxy]propyl ester (“SiGMA”), 2-hydroxy-3-methacryloxypropyloxypropyl-tris(trimethylsiloxy)silane, 3-methacryloxypropyltris(trimethylsiloxy)silane (“TRIS”), 3-methacryloxypropylbis(trimethylsiloxy)methylsilane and 3-methacryloxypropylpentamethyl disiloxane. When included, silicone containing components comprising TMS groups are present in amounts less than about 20 weight %, less than about 10 wt %, and in some embodiments, less than about 5 wt %. Where biomedical devices with modulus below about 200 are desired, only one R1 shall comprise a monovalent reactive group. wherein: R12 is hydrogen or methyl; R13 is hydrogen, an alkyl radical having 1 to 6 carbon atoms, or a —CO—Y—R15 radical wherein Y is —O—Y—S— or —NH—; R14 is a divalent radical having 1 to 12 carbon atoms; X denotes —CO— or —OCO—; Z denotes —O— or —NH—; Ar denotes an aromatic radical having 6 to 30 carbon atoms; w is 0 to 6; x is 0 or 1; y is 0 or 1; and z is 0 or 1. Other silicone-containing components suitable for use in this invention include those described is WO 96/31792 such as macromers containing polysiloxane, polyalkylene ether, diisocyanate, polyfluorinated hydrocarbon, polyfluorinated ether and polysaccharide groups. Another class of suitable silicone-containing components include silicone containing macromers made via GTP, such as those disclosed in U.S. Pat. Nos. 5,314,960, 5,331,067, 5,244,981, 5,371,147 and 6,367,929. U.S. Pat. Nos. 5,321,108; 5,387,662 and 5,539,016 describe polysiloxanes with a polar fluorinated graft or side group having a hydrogen atom attached to a terminal difluoro-substituted carbon atom. US 2002/0016383 describe hydrophilic siloxanyl methacrylates containing ether and siloxanyl linkanges and crosslinkable monomers containing polyether and polysiloxanyl groups. Any of the foregoing polysiloxanes can also be used as the silicone-containing component in this invention. The silicone containing components may be present in amounts up to about 95 weight %, and in some embodiments between about 10 and about 80 and in other embodiments between about 20 and about 70 weight %, based upon all reactive components. The reactive mixture may also comprise at least one hydrophilic component in addition to the ionic component. Hydrophilic monomers can be any of the hydrophilic monomers known to be useful to make hydrogels. One class of suitable hydrophilic monomers include acrylic- or vinyl-containing monomers. Such hydrophilic monomers may themselves be used as crosslinking agents, however, where hydrophilic monomers having more than one polymerizable functional group are used, their concentration should be limited as discussed above to provide a contact lens having the desired modulus. The term “vinyl-type” or “vinyl-containing” monomers refer to monomers containing the vinyl grouping (—CH═CH2) and are generally highly reactive. Such hydrophilic vinyl-containing monomers are known to polymerize relatively easily. “Acrylic-type” or “acrylic-containing” monomers are those monomers containing the acrylic group: (CH2═CRCOX) wherein R is H or CH3, and X is O or N, which are also known to polymerize readily, such as N,N-dimethyl acrylamide (DMA), 2-hydroxyethyl methacrylate (HEMA), glycerol methacrylate, 2-hydroxyethyl methacrylamide, polyethyleneglycol monomethacrylate, mixtures thereof and the like. Hydrophilic vinyl-containing monomers which may be incorporated into the silicone hydrogels of the present invention include monomers such as N-vinyl amides, N-vinyl lactams (e.g. NVP), N-vinyl-N-methyl acetamide, N-vinyl-N-ethyl acetamide, N-vinyl-N-ethyl formamide, N-vinyl formamide, with NVP being preferred. Other hydrophilic monomers that can be employed in the invention include polyoxyethylene polyols having one or more of the terminal hydroxyl groups replaced with a functional group containing a polymerizable double bond. Examples include polyethylene glycol, ethoxylated alkyl glucoside, and ethoxylated bisphenol A reacted with one or more molar equivalents of an end-capping group such as isocyanatoethyl methacrylate (“IEM”), methacrylic anhydride, methacryloyl chloride, vinylbenzoyl chloride, or the like, to produce a polyethylene polyol having one or more terminal polymerizable olefinic groups bonded to the polyethylene polyol through linking moieties such as carbamate or ester groups. Still further examples are the hydrophilic vinyl carbonate or vinyl carbamate monomers disclosed in U.S. Pat. No. 5,070,215, and the hydrophilic oxazolone monomers disclosed in U.S. Pat. No. 4,910,277. Other suitable hydrophilic monomers will be apparent to one skilled in the art. In one embodiment the hydrophilic comprises at least one hydrophilic monomer such as DMA, HEMA, glycerol methacrylate, 2-hydroxyethyl methacrylamide, NVP, N-vinyl-N-methyl acrylamide, polyethyleneglycol monomethacrylate, and combinations thereof. In another embodiment, the hydrophilic monomers comprise at least one of DMA, HEMA, NVP and N-vinyl-N-methyl acrylamide and mixtures thereof. In another embodiment, the hydrophilic monomer comprises DMA. The hydrophilic monomers may be present in a wide range of amounts, depending upon the specific balance of properties desired. Amounts of hydrophilic monomer up to about 50 and preferably between about 5 and about 50 weight %, based upon all reactive components are acceptable. For example, in one embodiment lenses of the present invention comprise a water content of at least about 25%, and in another embodiment between about 30 and about 70%. For these embodiments, the hydrophilic monomer may be included in amounts between about 20 and about 50 weight %. Other components that can be present in the reaction mixture used to form the contact lenses of this invention include wetting agents, such as those disclosed in U.S. Pat. No. 6,367,929, WO03/22321, WO03/22322, compatibilizing components, such as those disclosed in US2003/162862 and US2003/125498, ultra-violet absorbing compounds, medicinal agents, antimicrobial compounds, copolymerizable and nonpolymerizable dyes, release agents, reactive tints, pigments, combinations thereof and the like. The sum of additional components may be up to about 20 wt %. In one embodiment the reaction mixtures comprise up to about 18 wt % wetting agent, and in another embodiment, between about 5 and about 18 wt % wetting agent. A polymerization catalyst may be included in the reaction mixture. The polymerization initiators includes compounds such as lauryl peroxide, benzoyl peroxide, isopropyl percarbonate, azobisisobutyronitrile, and the like, that generate free radicals at moderately elevated temperatures, and photoinitiator systems such as aromatic alpha-hydroxy ketones, alkoxyoxybenzoins, acetophenones, acylphosphine oxides, bisacylphosphine oxides, and a tertiary amine plus a diketone, mixtures thereof and the like. Illustrative examples of photoinitiators are 1-hydroxycyclohexyl phenyl ketone, 2-hydroxy-2-methyl-1-phenyl-propan-1-one, bis(2,6-dimethoxybenzoyl)-2,4-4-trimethylpentyl phosphine oxide (DMBAPO), bis(2,4,6-trimethylbenzoyl)-phenyl phosphineoxide (Irgacure 819), 2,4,6-trimethylbenzyldiphenyl phosphine oxide and 2,4,6-trimethylbenzoyl diphenylphosphine oxide, benzoin methyl ester and a combination of camphorquinone and ethyl 4-(N,N-dimethylamino)benzoate. Commercially available visible light initiator systems include Irgacure 819, Irgacure 1700, Irgacure 1800, Irgacure 819, Irgacure 1850 (all from Ciba Specialty Chemicals) and Lucirin TPO initiator (available from BASF). Commercially available UV photoinitiators include Darocur 1173 and Darocur 2959 (Ciba Specialty Chemicals). These and other photoinitators which may be used are disclosed in Volume III, Photoinitiators for Free Radical Cationic & Anionic Photopolymerization, 2nd Edition by J. V. Crivello& K. Dietliker; edited by G. Bradley; John Wiley and Sons; New York; 1998. The initiator is used in the reaction mixture in effective amounts to initiate photopolymerization of the reaction mixture, e.g., from about 0.1 to about 2 parts by weight per 100 parts of reactive monomer. Polymerization of the reaction mixture can be initiated using the appropriate choice of heat or visible or ultraviolet light or other means depending on the polymerization initiator used. Alternatively, initiation can be conducted without a photoinitiator using, for example, e-beam. However, when a photoinitiator is used, the preferred initiators are bisacylphosphine oxides, such as bis(2,4,6-trimethylbenzoyl)-phenyl phosphine oxide (Irgacure 819®) or a combination of 1-hydroxycyclohexyl phenyl ketone and bis(2,6-dimethoxybenzoyl)-2,4-4-trimethylpentyl phosphine oxide (DMBAPO), and in another embodiment the method of polymerization initiation is via visible light activation. A preferred initiator is bis(2,4,6-trimethylbenzoyl)-phenyl phosphine oxide (Irgacure 819®). In one embodiment the diluents are selected from 1,2-octanediol, t-amyl alcohol, 3-methyl-3-pentanol, decanoic acid, 3,7-dimethyl-3-octanol, tripropylene methyl ether (TPME), butoxy ethyl acetate, mixtures thereof and the like. After curing the lens is subjected to extraction to remove unreacted components and release the lens from the lens mold. The extraction may be done using conventional extraction fluids, such organic solvents, such as alcohols or may be extracted using aqueous solutions. Aqueous solutions are solutions which comprise water. In one embodiment the aqueous solutions of the present invention comprise at least about 30% water, in some embodiments at least about 50% water, in some embodiments at least about 70% water and in others at least about 90 weight % water. Aqueous solutions may also include additional water soluble components such as release agents, wetting agents, slip agents, pharmaceutical and nutraceutical components, combinations thereof and the like. Release agents are compounds or mixtures of compounds which, when combined with water, decrease the time required to release a contact lens from a mold, as compared to the time required to release such a lens using an aqueous solution that does not comprise the release agent. In one embodiment the aqueous solutions comprise less than about 10 weight %, and in others less than about 5 weight % organic solvents such as isopropyl alcohol, and in another embodiment are free from organic solvents. In these embodiments the aqueous solutions do not require special handling, such as purification, recycling or special disposal procedures. The lenses may be sterilized by known means such as, but not limited to autoclaving. In addition to displaying desirable stability, the lenses of the present invention also display compatibility with the components of human tears. Human tears are complex and contain a mixture of proteins, lipids and other components which help to keep the eye lubricated. Examples of lipids classes include wax ester, cholesterolesters and cholesterol. Examples of proteins which are found in human tears include lactoferrin, lysozyme, lipocalin, serum albumin, secretory immunoglobulin A. Lipocalin is a lipid binding protein. The amount of lipocalin uptake to a contact lens has been negatively correlated to lens wettability (as measured via contact angle, such as via sessile drop), the propensity of lenses to uptake lipids from the tear film and consequently deposits on the front surface of the lens. Lenses which uptake low levels of lipocalin are therefore desirable. In one embodiment of the present invention, the lenses uptake less than about 3 μg lipocalin from a 2 mg/ml lipocalin solution over 72 hours incubation at 35° C.
Lysozyme is generally present in human tears in substantial concentrations. Lysozyme is bacteriolytic and believed to protect the eye against bacterial infection. The amount of lysozyme which associates with commercially available contact lenses varies greatly from only a few micrograms to over 800 micrograms for etafilcon A contact lenses (commercially available from Johnson & Johnson Vision Care, Inc., under the ACUVUE and ACUVUE2 brand names). Etafilcon A contact lenses have been commercially available for many years and display some of the lowest adverse event rates of any soft contact lens. Thus, contact lenses which uptake substantial levels of lysozyme are desirable. The lenses of the present invention uptake at least about 50 μg, 100 μg, 200 μg, 500 μg of lysozyme and in some embodiments at least about 800 μg lysozyme, all from a 2 mg/ml solution over 72 hours incubation at 35° C.
In addition to lysozyme, lactoferrin is another important cationic protein in the tears, mainly by the virtue of its anti-bacterial and anti-inflammatory properties. Upon wear, contact lenses uptake various amounts of lactoferrin, depending upon their polymer composition (for non-surface modified lenses) and the composition and integrity of the surface coating (for surface modified contact lenses). In one embodiment of the present invention, lenses uptake at least about 5 μg, and in some embodiments, at least about 10 micrograms lactoferrin following overnight soaking of the lenses in 2 mls of a 2 mg/ml lactoferrin solution. The lactoferrin solution contains lactoferrin from human milk (Sigma L-0520) solubilized at a concentration of 2 mg/ml in phosphate saline buffer. Lenses are incubated in 2 ml of the lactoferrin solution per lens for 72 hours at 35° C., using the procedure described below for lipocalin and lysozyme. In one embodiment the ophthalmic devices of the present invention also uptake less than about 20%, in some embodiments less than about 10%, and in other embodiments less than about 5% Polyquaternium-1 (dimethyl-bis[(E)-4-[tris(2-hydroxyethyl)azaniumyl]but-2-enyl]azanium trichloride) (“PQ1”) from an ophthalmic solution containing 0.001 wt % PQ1). The lenses of the present invention have a number of desirable properties in addition to the protein uptake characteristics described herein. In one embodiment the lenses have an oxygen permeability greater than about 50 and in other embodiment greater than about 60, in other embodiments greater than about 80 and in still other embodiments at least about 100. In some embodiments the lenses have tensile moduli less than about 100 psi. Modulus (tensile modulus) is measured by using the crosshead of a constant rate of movement type tensile testing machine equipped with a load cell that is lowered to the initial gauge height. A suitable testing machine includes an Instron model 1122. A dog-bone shaped sample from a −1.00 power lens having a 0.522 inch length, 0.276 inch “ear” width and 0.213 inch “neck” width is loaded into the grips and elongated at a constant rate of strain of 2 in/min. until it breaks. The initial gauge length of the sample (Lo) and sample length at break (Lf) are measured. At least five specimens of each composition are measured and the average is reported. Tensile modulus is measured at the initial linear portion of the stress/strain curve. Diameter may be measured using the modulation image generated from a Mach-Zehnder interferometer with the lenses submersed in saline solution and mounted concave surface down in a cuvette, as further described in US2008/0151236. The lenses are equilibrated for 15 minutes at about 20° C. before measurement. Water content is measured as follows. The lenses to be tested are allowed to sit in packing solution for 24 hours. Each of three test lens are removed from packing solution using a sponge tipped swab and placed on blotting wipes which have been dampened with packing solution. Both sides of the lens are contacted with the wipe. Using tweezers, the test lens are placed in a weighing pan and weighed. The two more sets of samples are prepared and weighed as above. The pan and lenses are weighed three times and the average is the wet weight. Lysozyme and lipocalin uptake were measured out using the following solutions and method. The lysozyme solution contained lysozyme from chicken egg white (Sigma, L7651) solubilized at a concentration of 2 mg/ml in phosphate saline buffer supplemented by Sodium bicarbonate at 1.37 g/l and D-Glucose at 0.1 g/l. The lipocalin solution contained B Lactoglobulin (Lipocalin) from bovine milk (Sigma, L3908) solubilized at a concentration of 2 mg/ml in phosphate saline buffer supplemented by Sodium bicarbonate at 1.37 g/l and D-Glucose at 0.1 g/l. The plates containing the lenses and the control plates containing only protein solution and the lenses in the PBS, were parafilmed to prevent evaporation and dehydration, placed onto an orbital shaker and incubated at 35° C., with agitation at 100 rpm for 72 hours. After the 72 hour incubation period the lenses were rinsed 3 to 5 times by dipping lenses into three (3) separate vials containing approximately 200 ml volume of PBS. The lenses were blotted on a paper towel to remove excess PBS solution and transferred into sterile conical tubes (1 lens per tube), each tube containing a volume of PBS determined based upon an estimate of lysozyme uptake expected based upon on each lens composition. The lysozyme concentration in each tube to be tested needs to be within the albumin standards range as described by the manufacturer (0.05 micogram to 30 micrograms). Samples known to uptake a level of lysozyme lower than 100 μg per lens were diluted 5 times. Samples known to uptake levels of lysozyme higher than 500 μg per lens (such as etafilcon A lenses) are diluted 20 times. 1 ml aliquot of PBS was used for samples 9, CE2 and the balafilcon lenses, and 20 ml for etafilcon A lens. Each control lens was identically processed, except that the well plates contained PBS instead of either lysozyme or lipocalin solution. Lysozyme and Lipocalin uptake was determined using on-lens bicinchoninic acid method using QP-BCA kit (Sigma, QP-BCA) following the procedure described by the manufacturer (the standards prep is described in the kit) and is calculated by subtracting the optical density measured on PBS soaked lenses (background) from the optical density determined on lenses soaked in lysozyme solution. Lysozyme activity was measured using the solution and incubation procedure described above for lysozyme uptake. After the incubation period the lenses were rinsed 3 to 5 times by dipping lenses into three (3) separate vials containing approximately 200 ml volume of PBS. The lenses were blotted on a paper towel to remove excess PBS solution and transferred into sterile, 24 well cell culture plates (one lens per well) each containing 2 ml of extraction solution composed of a 50:50 mix of 0.2% of trifluoroacetic acid and acetonitrile (TFA/ACN) solution. The lenses were incubated in the extraction solution for 16 hours at room temperature. In parallel, the lysozyme control solution was diluted in the extraction buffer to a range of concentrations with bracket the expected lysozyme uptake of the lenses being analyzed. For the examples of the present application the expected lysozyme concentrations were 10, 50, 100, 800 and the control solution were diluted to those concentrations and incubated for 16 hours at room temperature. The lysozyme extracts from both the lenses and the controls were assayed for lysozyme activity using EnzChek® Lysozyme Assay Kit (invitrogen) following the instructions described by the manufacturer. The EnzChek kit is a fluorescence based assay to measure levels of lysozyme activity in solution down to 20 U/ml. The test measures lysozyme activity on Micrococcus Lysodeikticus cell walls, which are labelled in such a degree that the fluorescence is quenched. Lysozyme action relieves this quenching, yielding an increase in fluorescence that is proportional to lysozyme activity. The fluorescence increase is measured using a fluorescence microplate reader that can detect fluorescein using excitation/emission weivelenghs of 494/518 nm. A Synergy HT microplate reader was used in the examples of the present application. The assay is based on the preparation of lysozyme standard curve using the same lysozyme incubated with the lenses or as a control. Lysozyme activity is expressed in fluorescence units and plotted against lysozyme concentrations expressed in Units/ml. Activity of lysozyme extracted from the lenses as well as lysozyme control was measured and converted using standard curve to an activity expressed in units per ml. % of active or native lysozyme on lens=Lysozyme(unit/ml)extracted from the lens×100/Lysozyme(unit per ml)obtained from control. Oxygen permeability (Dk) was determined by the polarographic method generally described in ISO 9913-1: 1996(E), but with the following variations. The measurement is conducted at an environment containing 2.1% oxygen. This environment is created by equipping the test chamber with nitrogen and air inputs set at the appropriate ratio, for example 1800 ml/min of nitrogen and 200 ml/min of air. The t/Dk is calculated using the adjusted oxygen concentration. Borate buffered saline was used. The dark current was measured by using a pure humidified nitrogen environment instead of applying MMA lenses. The lenses were not blotted before measuring. Four lenses were stacked instead of using lenses of varied thickness. A curved sensor was used in place of a flat sensor. The resulting Dk value is reported in barrers. These examples do not limit the invention. They are meant only to suggest a method of practicing the invention. Those knowledgeable in contact lenses as well as other specialties may find other methods of practicing the invention. However, those methods are deemed to be within the scope of this invention. PBS phosphate buffered saline, containing calcium and magnesium (Sigma, D8662). Lenses having the formulations shown in Table 1 were made as follows. The diluent for Examples 1-3 was a mixture of 18.33 gm PVP 2500/48.34 gm t-amyl alcohol. The diluent for Example 4 was 16.2 gm PVP 2500/64.8 gm t-amyl alcohol. The monomer mixes were dispensed into Zeonor front and Zeonor:Polypropylene (55:45) back curves. The monomer mixtures were cured under visible light (Philips TL-03 bulbs) in a nitrogen atmosphere (about 3% O2) using the following cure profile: 1 mW/cm2 for about 20 seconds at ambient temperature, 1.8±0.5 mW/cm2 for about 270 seconds at 75±5° C., and 6.0±0.5 mW/cm2 for about 270 seconds at about 75±5° C.
After curing, the molds were opened, and the lenses released in 70% IPA in DI water. After about 40-50 minutes the lenses were transferred into: i) 70% IPA in DI water for about 40-50 minutes; ii) 70% IPA in DI water for about 40-50 minutes; and iii) DI water for at least about 30 minutes. The lenses were packaged in 950+/−50 uL of borate buffered sodium sulfate solution with 50 ppm methyl cellulose (SSPS) using polypropylene bowls and foil, and autoclaved once (124° C., 18 minutes). Lenses were made using the formulation listed in Table 1, for Example 4, and the conditions described in Example 1, except that the cure profile was: 1 mW/cm2 (10-30 seconds, ambient temperature), 1.5±0.2 mW/cm2 (about 160 seconds, at 80±5° C.), 6.0±0.2 mW/cm2 (about 320 seconds, at about 80±5° C.)]. The molds were opened, and the lenses released in 70% IPA in DI water. After 60 minutes the lenses were transferred into: i) 100% IPA for 60 minutes; ii) 70% IPA in DI water for 60 minutes; iii) DI water for 30 minutes; iv) DI water for 30 minutes; v) DI water for 30 minutes. The lenses were silver-treated by exposure to aqueous sodium iodide solution, followed by exposure to aqueous silver nitrate solution. The lenses were packaged in 10 mL of SSPS in glass vials with silicone stoppers, and autoclaved three times (121° C., 30 minutes). Lenses from Examples 1-4 and Comparative Example 1 were placed in a chamber with temperature controlled at 55° C. Lenses were pulled from the chamber at established intervals, and tested for modulus, maximum strain and diameter (for Examples 1-3, lenses were pulled at each time point for measurement as follows: 8-10 lenses for diameter measurement, 9 lenses for % H2O and 8-10 lenses for mechanical property testing; for Example 4, 5 lenses were pulled at each time point as follows: 5 lenses for diameter testing, 9 lenses for % H2O and 5 lenses for mechanical properties). The stability data from Examples 1-4 is shown in FIG. 1. In addition, stability data from lenses made according to Comparative Example 1, below, which had no ionic component, are also included as a non-ionic control. The modulus of the lenses was measured at various time intervals and is reported in Tables 2 and 3. FIG. 1 is a graph showing of the modulus vs. time data included in Tables 2 and 3, above. The lines for the comparative Example and Example 4 are very flat, due to the small changes in modulus over the time periods measured. As the concentration of methacrylic acid and mole product increases, the slope of the line also increases, with a substantial increase between Example 1 (having a concentration of 1 wt % methacrylic acid and a stability product of 0.0017) and Example 3, having a concentration of 1.6 wt % methacrylic acid and a mole product of 0.0024. The changes in lens diameter and strain provide additional confirmation of trends observed in the modulus. FIG. 1 clearly shows the relationship between hydrolytic stability of lenses, and the mole product of anionic group (carboxylate) and TMS silicon content. Only moles of silicon (Si) derived from trimethylsilyl-containing monomers (TRIS or SIMAA2) were used in the calculation of the mole product listed in Tables 2 and 3. From these experiments it was surprisingly found that the stability of silicone hydrogel lenses comprising a silicone component having at least one TMS group and at least one anionic component, such as methacrylic acid, display a sharp drop in stability above a certain concentration of the anionic component. Thus, Examples 1 and 2 have substantially similar stability even though the Example 1 contains twice as much methacrylic acid (1%) than Example 2 (0.5%). However, the stability of the lenses made in Example 3 were much worse than Examples 2 and 3. This result was unexpected, and provides a small formulating window for including anionic components and silicone components comprising at least one TMS group. The inclusion of TMS containing silicone monomer components in amounts that provide the recited stability products provides the ability to balance stability with other properties, such as a desired modulus, elongation or tan delta. The stability products, methacrylic acid concentrations and % change in modulus are shown in Table 8, below. The reactive monomer mixture listed in Table 1 under CE 1 was dosed into Zeonor front curves, and the molds were closed using Zeonor back curves. The lenses were cured under visible light in a nitrogen atmosphere. Cure profile: 1) Pre-cure (TLDK-30 W/03 bulbs, 30-120 sec, 60-80° C.); 2) Cure (TLD-30 W/03 bulbs, 320-800 sec, 70-80° C.). The molds were opened, and the lenses released were extracted and hydrated in IPA/water mixtures. The finished lenses were packaged in borate buffered saline. A monomer mixture was formed by mixing the components in the amounts listed in Table 4. The monomer mixes were dispensed into Zeonor front and Zeonor:Polypropylene (55:45) back curves. The molds were closed and the filled, closed monomers were held at 65° C. with no irradiation. The monomer mixtures were cured under visible light (Philips TL-03 bulbs) at 65° C. in a nitrogen atmosphere (about 3% O2) using the following cure profile: 1.5 mW/cm2 for about 330 seconds, 7±01 mW/cm2 for about 440 seconds. After curing, the molds were opened, and the lenses released in 70% IPA in DI water. After about 60-70 minutes the lenses were transferred into: i) 70% IPA in DI water for about 30-40 minutes; ii) 70% IPA in DI water for about 30-40 minutes; and iii) DI water for at least about 30 minutes. The lenses were placed in a chamber with the temperature controlled at 55° C. Lenses were pulled from the chamber at 5, 10 weeks, and tested for modulus, maximum strain, diameter and % water. The results are shown in Table 5. Example 5 was repeated, except that the diluent was changed to those shown in Tables 6-7 below. The lenses were placed in a chamber with the temperature controlled at 55° C. Lenses were pulled from the chamber at 5, 10, 15 and 20 weeks, and tested for modulus, maximum strain and diameter, % water. The stability data from Examples 6-7 is shown in FIGS. 3 and 4. The stability product, weight % methacrylic acid and percent change in modulus for each of the Examples is shown in Table 8, below. **measurements taken at 20 weeks. The modulus change noted for Comparative Example 1 illustrates that modulus can vary by as much as 10% without an anionic component. This is also shown by the standard deviations noted in Tables 2 and 3. The change in modulus reported for Examples 6 and 7 are reported as negative values because the modulus was slightly lower after 10 and 20 weeks. However, the changes are within the standard deviation for the modulus test method, and should be considered as representing no change. Table 8 also shows that the best results were achieved in formulations which did not have any silicone monomers having TMS group(s) as a component in the reaction mixture (Example 4, which had mPDMS and macromer, and Examples 5-7 which had HO-mPDMS). The Examples which had PDMS-type silicone as the only silicone (Examples 5-7) displayed the best stability. To a stirred solution of 45.5 kg of 3-allyloxy-2-hydroxypropane methacrylate (AHM) and 3.4 g of butylated hydroxy toluene (BHT) was added 10 ml of Pt (0) divinyltetramethyldisiloxane solution in xylenes (2.25% Pt concentration) followed by addition of 44.9 kg of n-butylpolydimethylsilane. The reaction exotherm was controlled to maintain reaction temperature of about 20° C. After complete consumption of n-butylpolydimethylsilane, the Pt catalyst was deactivated by addition of 6.9 g of diethylethylenediamine. The crude reaction mixture was extracted several times with 181 kg of ethylene glycol until residual AHM content of the raffinate was <0.1%. 10 g of BHT was added to the resulting raffinate, stirred until dissolution, followed by removal of residual ethylene glycol affording 64.5 kg of the OH-mPDMS. 6.45 g of 4-Methoxy phenol (MeHQ) was added to the resulting liquid, stirred, and filtered yielding 64.39 kg of final OH-mPDMS as colorless oil. The components listed in Table 9, (except PVP K90) were mixed in a jar for at least 1 hour with stirring. The PVP K90 was slowly added to the reactive mixture with stirring such that no clumps were formed during the addition. After all the PVP had been added the reactive mixture was stirred for an additional 30 minutes. The jar was sealed and put on a jar roller running at ˜200 rpm over night. The reactive mixture was degassed in a vacuum desiccator (around 1 cm Hg pressure) for about 40 minutes. The plastic lens molds and monomer dosing syringes were put in a N2 environment (<2% O2) for at least 12 hours. The back curve mold was made of 9544 polypropylene, and the front curve mold was made of Zeonor™. The reactive mixture (50 microliter) was dosed into each FC curve, and then BC curve was slowly deposited to close the molds. This process was carried out under N2 environment (<2% O2). The monomer mixtures were cured under visible light (Philips TLK 40 W/03 bulbs) in a nitrogen atmosphere (about <2% O2) using the following cure profile: 5±0.5 mW/cm2 for about 10 minutes at about 50±5° C.
The base curve was the removed from the assembly by prying. The lens remained with the front curve and the front curve was press-inverted to separate the dry lens from the front curve. Lysozyme and lipocalin uptake were measured as described above. Lysozyme is a hydrolytic enzyme able to cleave the cell wall of gram positive and some gram negative bacteria. 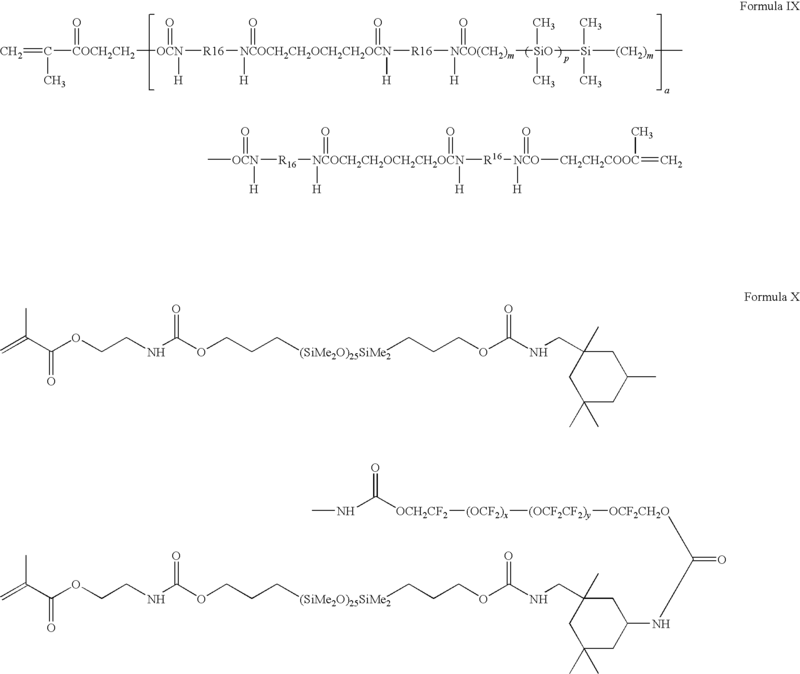 Cleavage of the peptidoglycan wall at the β1-4 linkage between N-acetyl-glucosamine and N acetyl galactosamine(muramate) results in lysis of the bacteria. Lysozyme activity was measured to determine the capacity of lenses to maintain this protein in its native state. The level of native lysozyme corresponds to the level of active lysozyme determined following the procedure described above. The results are shown in Table 10. Etafilcon A is the lens material used to make ACUVUE ® AND ACUVUE ® 2 lenses commercially available from Johnson & Johnson Vision Care, Inc.
Preservatives uptake from lens care solutions can impact contact lens performance, particularly contact lens induced corneal staining. Preservative uptake of the lenses of Example 9, Comparative Example 2, and Purevision was measured by incubating the above lenses in 3 ml of OptiFree® RepleniSH® for 72 hours at room temperature using the procedure described above to lysozyme and lipocalin uptake. OptiFree® RepleniSH® contains 0.001 wt % PQ1 as a disinfectant/preservative and citrate dihydrate and citric acid monohydrate concentrations are 0.56% and 0.021% (wt/wt). The quantity of PQ1 uptake was determined using HPLC analysis by comparing the level of PQ1 in the initial soak solution to the level of PQ1 after 72 h soak in presence of the test contact lens. The results are shown in Table 10. Formulations were made as in Example 9, but varying the concentration of methacrylic acid as shown in Table 11, below. The lysozyme and PQ1 uptake were measured as in Example 9, and the results are shown in Table 12, below. The results are also shown graphically in FIG. 1. As is seen in FIG. 5, formulations can be made which display desirable lysozyme uptake, and low PQ1 uptake with existing contact lens care solutions. Thus ophthalmic devices of the present invention display a balance of desirable protein uptake, compatibility with existing lens care solutions and thermal stability. 1. A polymer formed from reactive components comprising at least one silicone component comprising at least one trimethylsiloxy silyl group and at least one ionic component comprising at least one anionic group wherein said silicone component and said ionic component are present in said polymer in molar concentrations providing a stability product less than about 0.002. 2. The polymer of claim 1 wherein said stability product is less than about 0.001. 3. The polymer of claim 1 wherein said stability product is less than about 0.0006.
where b=0 to 100, R1 is a monovalent group comprising at least one ethylenically unsaturated moiety; each R2 is independently a monovalent alkyl, or aryl group, which may be further substituted with alcohol, amine, ketone, carboxylic acid or ether groups; R3 is a monovalent alkyl, or aryl group, which may be further substituted with alcohol, amine, ketone, carboxylic acid or ether groups; and R4 is independently alkyl, aromatic, or a monovalent siloxane chain comprising from 1 to 100 repeating Si—O units. 5. The polymer of claim 4 wherein said at lest one silicone component is selected from the group consisting of monomethacryloxypropyl terminated mono-n-alkyl terminated polydialkylsiloxane, bis-3-acryloxy-2-hydroxypropyloxypropyl polydialkylsiloxane, methacryloxypropyl-terminated polydialkylsiloxane, mono-(3-methacryloxy-2-hydroxypropyloxy)propyl terminated, mono-alkyl terminated polydialkylsiloxane and combinations thereof. 6. The polymer of claim 1 wherein said at least one silicone component is selected from monomethacryloxypropyl terminated mono-n-butyl terminated polydimethylsiloxane, bis-3-acryloxy-2-hydroxypropyloxypropyl polydialkylsiloxane, and mono-(3-methacryloxy-2-hydroxypropyloxy)propyl terminated, mono-butyl terminated polydialkylsiloxane combinations thereof and the like. 7. The polymer of claim 1 wherein said at least one silicone component is selected from monomethacryloxypropyl-terminated mono-n-butyl terminated polydimethysiloxane, bis-3-acryloxy-2-hydroxypropyloxypropyl polydimethylsiloxane, methacryloxypropyl-terminated polydimethylsiloxane and mono-(3-methacryloxy-2-hydroxypropyloxy)propyl terminated, mono-butyl terminated polydimethylsiloxane and mixtures thereof. 8. The polymer of claim 1 wherein said ionic component is a carboxylic acid containing component selected from the group consisting of free radical reactive carboxylic acids comprising 1-8 carbon atoms. 9. The polymer of claim 8 wherein said carboxylic acid-containing component is selected from the group consisting of (meth)acrylic acid, acrylic acid, itaconic acid, crotonic acid, cinnamic acid, vinylbenzoic acid, fumaric acid, maleic acid, N-vinyloxycarbonyl alanine and mixtures thereof. 10. The polymer of claim 8 wherein said carboxylic acid-containing component comprises methacrylic acid. where b=2 to 20; terminal R1 are independently selected from monovalent groups comprising at least one ethylenically unsaturated moiety, monovalent alkyl group having 2 to 16 carbon atoms, provided that one terminal R1 comprises an ethylenically unsaturated moiety, and the remaining R1 are selected from monovalent alkyl groups having 1 to 16 carbon atoms. 12. A contact lens formed by polymerizing components comprising at least one silicone component and at least one ionic component wherein said ionic component is present in said polymer in concentration less than 0.8 wt % and wherein said contact lens absorbs at least about 10 μg lysozyme, less than about 5 μg lipocalin and wherein at least about 50% of all proteins absorbed in or on said contact lens are in native form. 13. The contact lens of claim 12 wherein said ionic component comprises at least one polymerizable group and three to ten carbon atoms. 14. The contact lens of claim 12 where said ionic component comprises three to eight carbon atoms. 15. The contact lens of claim 1 wherein said ionic component comprises at least one carboxylic acid group. 16. The contact lens of claim 15 wherein said ionic component is selected from the group consisting of acrylic acid, methacrylic acid, furmaric acid, maelic acid, itaconic acid, crotonic acid, cinnamic acid, vinylbenzoic acid, monoesters of furmaric acid, maelic acid and itaconic acid and N-vinyloxycarbonyl alanine (N-vinyloxycarbonyl-β-alanine) and homopolymers and copolymers thereof. 17. The contact lens of claim 12 wherein said contact lens absorbs at least about 50 μg lysozyme. 18. The contact lens of claim 12 wherein said contact lens absorbs at least about 100 μg lysozyme. 19. The contact lens of claim 12 wherein said contact lens absorbs at least about 200 μg lysozyme. 20. The contact lens of claim 12 wherein said contact lens absorbs at least about 500 μg lysozyme. 21. The contact lens of claim 12 wherein said contact lens absorbs at least about 800 μg lysozyme. 22. The contact lens of claim 12 wherein said contact lens absorbs about 3 μg or less lipocalin. 23. The contact lens of claim 12 wherein at least about 60% of all proteins absorbed in or on said contact lens are in native form. 24. The contact lens of claim 1 wherein at least about 75% of all proteins absorbed in or on said contact lens are in native form. 25. The contact lens of claim 12 further comprising a water content of at least about 15%. 26. The contact lens of claim 12 further comprising a Dk of at least about 50. 27. The contact lens of claim 16 wherein at least about 60% of all proteins absorbed in or on said contact lens are in native form. 28. The contact lens of claim 16 wherein at least about 75% of all proteins absorbed in or on said contact lens are in native form. where b=0 to 100; R1 is a monovalent group comprising at least one ethylenically unsaturated moiety; each R2 is independently a monovalent alkyl, or aryl group, which may be further substituted with alcohol, amine, ketone, carboxylic acid, ether groups or combinations thereof; R3 is a monovalent alkyl, or aryl group, which may be further substituted with alcohol, amine, ketone, carboxylic acid, ether groups or combinations thereof; and R4 is independently alkyl, aromatic, or a monovalent siloxane chain comprising from 1 to 100 repeating Si—O units. 30. The contact lens of claim 29 wherein said at least one silicone component is selected from the group consisting of monomethacryloxypropyl terminated mono-n-alkyl terminated polydialkylsiloxane, bis-3-acryloxy-2-hydroxypropyloxypropyl polydialkylsiloxane, methacryloxypropyl-terminated polydialkylsiloxane, mono-(3-methacryloxy-2-hydroxypropyloxy)propyl terminated, mono-alkyl terminated polydialkylsiloxane and combinations thereof. 31. The polymer of claim 29 wherein said at least one silicone component is selected from monomethacryloxypropyl terminated mono-n-C1-4 alkyl terminated polydimethylsiloxane, bis-3-acryloxy-2-hydroxypropyloxypropyl polydialkylsiloxane, and mono-(3-methacryloxy-2-hydroxypropyloxy)propyl terminated, mono-C1-4 alkyl terminated polydialkylsiloxane combinations thereof and the like. 32. The polymer of claim 29 wherein said at least one silicone component is selected from monomethacryloxypropyl-terminated mono-n-butyl terminated polydimethysiloxane, bis-3-acryloxy-2-hydroxypropyloxypropyl polydimethylsiloxane, methacryloxypropyl-terminated polydimethylsiloxane and mono-(3-methacryloxy-2-hydroxypropyloxy)propyl terminated, mono-butyl terminated polydimethylsiloxane and mixtures thereof. 33. A contact lens formed by polymerizing components comprising at least one silicone component and at least one ionic component comprising at least one carboxylic acid group in molar concentrations up to about 9.3 mmol/100 gm and wherein said contact lens absorbs at least about 10 μg lysozyme, less than about 5 μg lipocalin and wherein at least about 50% of proteins absorbed in or on said contact lens are in native form. 34. The contact lens of claim 33 wherein said ionic component comprises at least one polymerizable group and three to ten carbon atoms. 35. The contact lens of claim 34 where said ionic component comprises three to eight carbon atoms. 36. The contact lens of claim 33 wherein said ionic component is selected from the group consisting of acrylic acid, methacrylic acid, furmaric acid, maelic acid, itaconic acid, crotonic acid, cinnamic acid, vinylbenzoic acid, monoesters of furmaric acid, maelic acid and itaconic acid and N-vinyloxycarbonyl alanine (N-vinyloxycarbonyl-β-alanine) and homopolymers and copolymers thereof. 37. The contact lens of claim 33 wherein said contact lens absorbs at least about 50 μg lysozyme. 38. The contact lens of claim 33 wherein said contact lens absorbs at least about 100 μg lysozyme. 39. The contact lens of claim 33 wherein said contact lens absorbs at least about 200 μg lysozyme. 40. The contact lens of claim 33 wherein said contact lens absorbs at least about 500 μg lysozyme. 41. The contact lens of claim 33 wherein said contact lens absorbs at least about 800 μg lysozyme. 42. The contact lens of claim 33 wherein said contact lens absorbs about 3 μg or less lipocalin. 43. The contact lens of claim 33 wherein at least about 60% of all proteins absorbed in or on said contact lens are in native form. 44. The contact lens of claim 33 wherein at least about 75% of all proteins absorbed in or on said contact lens are in native form. 45. The contact lens of claim 33 further comprising a water content of at least about 15%. 46. The contact lens of claim 33 further comprising a contact angle of less than about 90°. 47. The contact lens of claim 46 wherein at least about 60% of all proteins absorbed in or on said contact lens are in native form. 48. The contact lens of claim 46 wherein at least about 75% of all proteins absorbed in or on said contact lens are in native form. where b=2 to 20; at least one terminal R1 comprises a monovalent reactive group, the other terminal R1 comprises a monovalent reactive group or a monovalent alkyl group having 1-16 carbons and the remaining R1 are independently selected from monovalent alkyl groups having 1-16 carbons. 50. The contact lens of claim 33 wherein said at least one silicone component is selected from the group consisting of monomethacryloxypropyl terminated mono-n-alkyl terminated polydialkylsiloxane, bis-3-acryloxy-2-hydroxypropyloxypropyl polydialkylsiloxane, methacryloxypropyl-terminated polydialkylsiloxane, mono-(3-methacryloxy-2-hydroxypropyloxy)propyl terminated, mono-alkyl terminated polydialkylsiloxane and combinations thereof. 51. The polymer of claim 33 wherein said at least one silicone component is selected from monomethacryloxypropyl terminated mono-n-C1-4 alkyl terminated polydimethylsiloxane, bis-3-acryloxy-2-hydroxypropyloxypropyl polydialkylsiloxane, and mono-(3-methacryloxy-2-hydroxypropyloxy)propyl terminated, mono-C1-4 alkyl terminated polydialkylsiloxane combinations thereof. 52. The polymer of claim 33 wherein said at least one silicone component is selected from monomethacryloxypropyl-terminated mono-n-butyl terminated polydimethysiloxane, bis-3-acryloxy-2-hydroxypropyloxypropyl polydimethylsiloxane, methacryloxypropyl-terminated polydimethylsiloxane and mono-(3-methacryloxy-2-hydroxypropyloxy)propyl terminated, mono-butyl terminated polydimethylsiloxane and mixtures thereof.